Michigan's Department of Environmental Quality Director has resigned and Gov. Rick Snyder has apologized for the state's handling of the water crisis in Flint, where lead levels have been found to be rising. 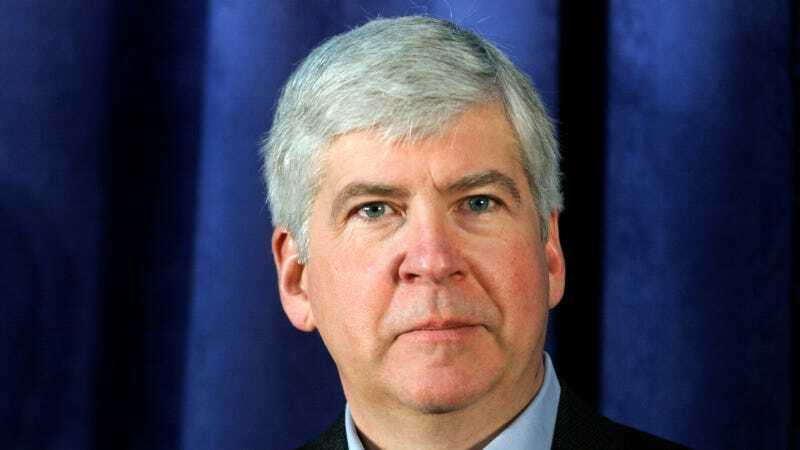 “I want the Flint community to know how very sorry I am that this has happened," Snyder said. "And I want all Michigan citizens to know that we will learn from this experience, because Flint is not the only city that has an aging infrastructure." The situation dates back to 2014, when the city switched its water supplies from Lake Huron to the heavily polluted Flint River at the suggestion of its emergency managers, who were appointed as the city teetered on the verge of bankruptcy. But the state failed to require corrosion-control chemicals to the water that would have prevented lead from leaking into the drinking water from pipes, connections, and fixtures, the Detroit Free Press reports. That prompted "immediate complaints from Flint residents about the taste, smell, and appearance of the water." Eventually, blood test results conducted by the local children's hospital showed elevated lead levels in Flint children. NPR reported that Dr. Mona Hanna-Attisha of the Hurley Children's Hospital found that the percentage of Flint children 5 years and younger with elevated lead levels nearly doubled after the switch, from 2.1% to 4%. Lead can cause irreversible brain damage in children and has also been linked to behavioral problems. A DEQ public information officer who initially criticized the hospital's report as irresponsible also resigned Tuesday, the Press reported.